Begin your journey in Venice, the “City of Canals,” where you will learn the history and legends behind the architectural icons and great works of art in this unique 600-year old city—Doge’s Palace, Rialto Bridge, Saint Mark’s Basilica and more. In Florence, feel the true pulse and creativity of the Renaissance as you gaze upon the works of artistic masters such as Botticelli, Michelangelo and others. Next, experience La Dolce Vita lifestyle with a stay in Tuscany—sample world-famous wines and relax at your lush Italian estate. In Rome, relive the glory of the Roman Empire as you explore the ancient Coliseum, the resplendent Vatican’s Saint Peter’s Basilica, and the awe-inspiring Sistine Chapel. 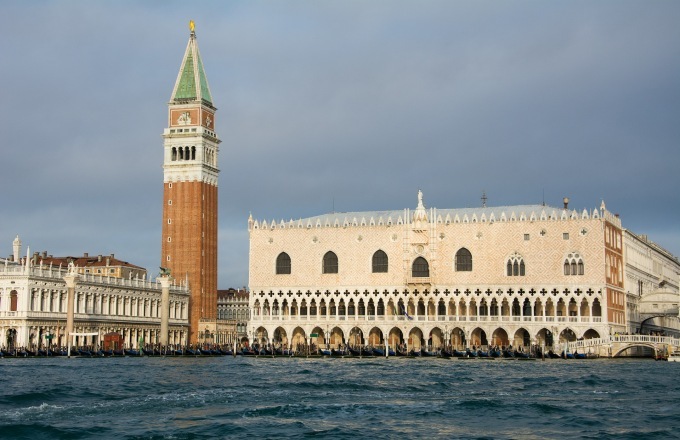 You are met on arrival at Venice airport, and taken on a private boat trip down the Grand Canal en route to your hotel. Experience the ebb and flow of life in the lagoon city on a full-day walking tour. Begin in the heart of Venice, at the Piazza San Marco, crowned at its eastern end by the golden splendor of Saint Mark’s Basilica, also known as the “Church of Gold.” Visit this symbol of Venetian wealth and power, embellished with marble, glittering Byzantine mosaics, gold, and priceless works of art. Also on the Piazza is the most impressive building in Venice, the Doge’s Palace, a gothic palace constructed in the 14th century. In addition to being the Ducal residence, it housed the Grand Chamber Council, where the ruling elite of Venice governed the daily affairs of the Republic. Next, stroll past the Clock Tower, and Santa Maria Formosa on the way to the Campo SS. Giovanni e Paolo the second largest square in Venice. The Campo is home to one of the largest Italian Gothic-style Basilicas, where 25 doges are interred, and is often referred to as the Pantheon of Venice for its famous statuary. Watch the menagerie vessels navigate along the Grand Canal, and then cross over the canal via the 400 year-old Rialto Bridge. Return to the Piazza San Marco, and enjoy time to explore this large and lively market square, visiting its chic shops, trattorias and cafes invigorated with the hypnotic aroma of rich Italian espresso. Your tour ends with a private boat ride down the canals of Venice. The rest of the day and evening is at leisure to enjoy this hypnotically beautiful city. Say arrivederci to Venice this morning as you are escorted on a scenic drive to Florence. Florence is the hub of Renaissance art, science and architecture. Beginning in the late 14th century, the city was controlled by the House of Medici, a banking family which later created the largest bank in Europe. The Medici’s and other elite families inspired the birth of the Italian Renaissance, a period of great cultural change and achievement. The era is best known for promoting creativity in art, philosophy, society, science and architecture. Enjoy the remainder of your day at your leisure in this artistic provincial capital. Your full- day Florence sightseeing starts at Pitti Palace to wander through the formal Italian-style Boboli Gardens. Then continue with walking tour through the heart of the city. Tour the famous Piazza della Signoria, the main square fronting the Palazzo Vecchio, a massive decorated palace and one of the most impressive town halls of Tuscany. The Piazza della Signoria is also the gateway to the world-renown Uffizi Gallery. A great architectural work, this famous and celebrated art museum houses one of the best masterpiece art collections in the world. Enjoy a privately guided tour to view the works of Botticelli, Leonardo da Vinci, and Michelangelo. This morning begins with a visit to the Church of Santa Croce, a Gothic church containing tombs of many famous artists including Michelangelo, Ghiberti, Machiavelli and Galileo. The interior is enhanced by the radiant frescoes of Giotto, and Brunelleschi's classical Cappella de' Pazzi is a masterpiece of the Renaissance architecture. Next, explore the Duomo, one of the largest churches in the Catholic world. First designed in 1294, it is still the highest building in Florence, with a warm exterior adorned with pink, white, red and green marble. Then stroll across the famed Ponte Vecchio with its countless craft vendors, and enjoy the rest of your day at leisure in this beautiful city. Admire the romantic scenery as you travel through the sun-kissed Tuscan landscape to Montalcino. Tonight, regale over a traditional Tuscan five-course wine pairing dinner. Enjoy a guided tour of Castello Banfi, a medieval fortress turned luxury estate. Explore its towering castle that sits high on a hill in the center of 7,000 acres. Visit the vineyards, tour the wine cellars, and enjoy tasting three premier Sangiovese wines. Visit the property’s Museum of Glass, featuring the most important private collection of Roman glassware in the world, with pieces dating back to the 5th century B.C. Relish the rest of your day at leisure, with time to relax at this beautiful estate. This morning, drive through the lush rolling hills of Tuscany as you travel south to magnificent Rome. Enjoy the afternoon at leisure in this fascinating and historic city. Spanning over 2,500 years, Rome’s history covers the brutal early days of the Roman Empire through the capricious birth of Christianity, then later the Italian Renaissance and finally what is now modern times. This morning, experience and explore the exciting streets and ancient ruins of Italy’s capital on a private full-day tour. View the massive Coliseum, where 50,000 spectators would witness grandiose public spectacles. Recently opened to the public, you can now explore the subterranean passageways used by the wild animals and gladiators. In the Middle Ages, the Coliseum was transformed into a marble, lead and iron quarry to build Piazza Venezia and St. Peter’s Basilica, your next stop. A glorious example of High Renaissance and Baroque architecture, St. Peter’s Basilica is also the largest church in the world. Enter to examine Michelangelo’s dome and his exquisite Pieta, as well as Bernini's bronze baldachin that sits above the papal altar. Continue through the complex of the Vatican Museums, to visit the stunning Sistine Chapel, Michelangelo's masterpiece. Commissioned in 1508, his fresco covers more than 10,000 square feet of the Sistine Chapel's ceiling. Enjoy the rest of your day and evening is at your leisure discovering the Eternal City. Enjoy time at leisure until your transfer to the Rome airport for your flight home or onwards to your next destination. Opened in 2013, the 4-star Luxury rated "Ai Reali" Hotel is located in an ancient aristocratic Venetian palace, in the historical center of the city, between Rialto and Piazza San Marco. The Hotel, that also hosts the “Alle Corone” Restaurant, the lounge bar, the “Reali Wellness & Spa” wellness center and a conference center, stands out for its highly refined elegance and for the attention of its staff to the slightest detail, wishing its guests to feel like they have a second house in Venice. J.K. Place Firenze Hotel is a sophisticated hotel, with working fireplaces, lamps from the 50’s and the 60’s, antiques and family treasures that accumulate over generations. J.K. Place has luxurious rooms that will leave you in comfort and indulgent luxury. Enjoy the afternoon sun in the stylish courtyard or relax in the terrace, you will find a wonder retreat at this hotel. Castello Banfi – il Borgo offers 14 rooms and suites, varying in size, location and décor, all with carefully selected furnishings and fabrics, classic fixtures and luxuriant amenities. Each offers a King-sized bed, while the five designated suites are additionally furnished with a Queen-size sofa bed in a separate room. Federico Forquet of Cetona; one of Italy’s most renowned designers, worked with the Mariani family to create the elegant and comfortable interiors of the rooms and suites as well as the surrounding gardens. Castello Banfi has a restaurant at its vineyard estate in Montalcino, Tuscany, offering both formal and casual takes on local cuisine. Dining rooms in a historic stone building offer breathtaking views of the rolling Tuscan countryside, with patios for al fresco dining in the shadow of the medieval castle. The First Luxury Art Hotel Roma is truly one of a kind experience. The First Luxury Art Hotel Roma is a place where luxury and feeling at home interweave to create a new hospitality concept. Just a short walk from the Piazza del Popolo, Via del Corso, and The Spanish Steps, in the very heart of the city, this 5 star luxury boutique hotel is the ideal base to explore the beautiful capital while enjoying top-notch contemporary accommodations. 200 years of history. A thoughtful restoration has turned this 19th century nobleman's palace into an elegant and refined hotel; the noble lines, that look of an aristocratic home, all this have been preserved creating a welcoming and comfortable atmosphere. This is the central feature of this art hotel: being aesthetically luxurious while giving you the delightful sensation of feeling completely at home. Bedding down in an art gallery. Impressive pieces of contemporary artwork made by some of the most important artists of the Italian scene and designer furnishings are throughout the common areas and suites. With its permanent and temporary exhibits, each room becomes a small private gallery, “yours" for a few days. Immerse yourself in the elegant and relaxing atmosphere offered by The First Luxury Art Hotel Roma. Be carried away by the beauty of the works on exhibit and the enchanting views of the city of Rome. The First Luxury Art Hotel is a smoke-free hotel.